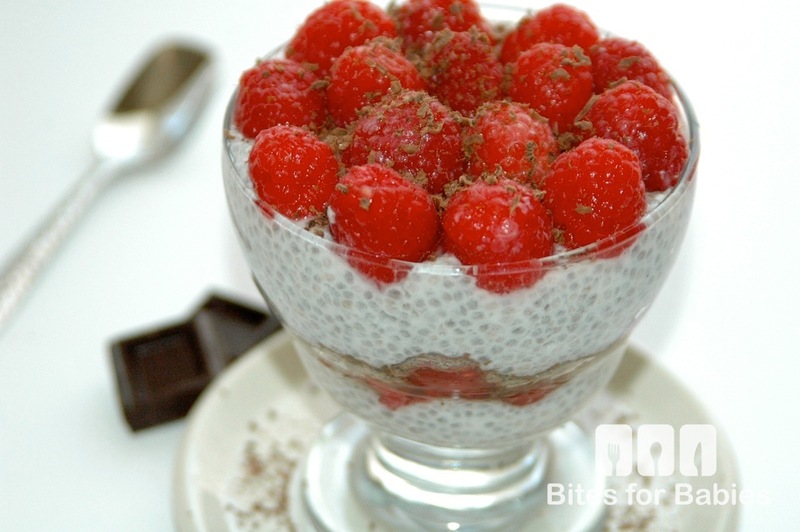 Chia pudding is the perfect blank canvas for any flavour pairing. This raspberry chocolate chia pudding combines the bright, fresh flavours of raspberries, the creaminess of Greek yogurt and coconut milk, and rich, decadent chocolate. 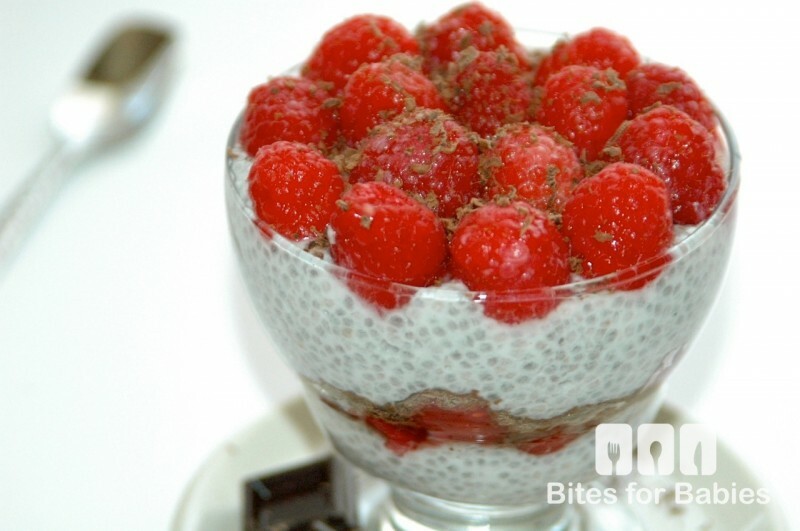 Raw puddings, such as this raspberry chocolate chia pudding parfait make quick, easy, and not to mention healthy snacks for the kids-or moms and dads for that matter! Made with superfood chia seeds this delicious, wholesome parfait is packed with fiber, protein, calcium, and antioxidants. Despite their tiny size, chia seeds are a superfood powerhouse as well as unbelievably versatile. I often use them as a substitute for eggs in baked goods, sprinkle them on yogurt or granola, or mix them into raw energy bars. Let’s talk texture, for just a minute. From my understanding, chia pudding is just one of those foods that you either like-or hate. It’s all about the texture. If you’re looking for a creamy, smooth pudding, this isn’t the pudding for you. On the contrary, when soaked these tiny, crunchy seeds are soaked in liquid, they transform into plump, gelatinous, tapioca-style morsels. 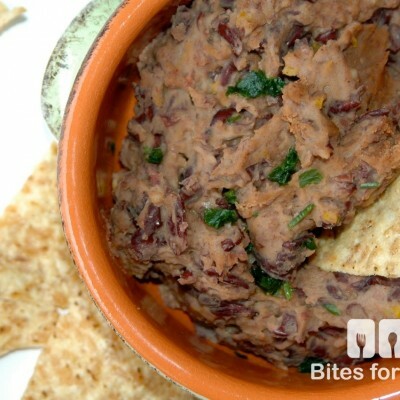 This recipe is both simple and adaptable, and the flavour combinations are limitless. You only need to keep in mind the ratio of chia seeds to liquid, which is usually 1/4 cup chia seeds to 1 cup milk of choice. For this recipe, I combined coconut milk and yogurt to yield one cup of liquid-but since the yogurt helps result in a thicker pudding, I added only 3 tablespoons of chia seeds, as opposed to 4 tablespoons. My suggestion is to play with the recipe and the ratios until you find the perfect consistency and texture to suit your tastes. On a final note, this recipe yields a lightly sweetened pudding however, if you’d like to satisfy your sweet tooth, you can always add more sweetener to taste. In a small bowl, combine the chia seeds with the coconut milk, Greek yogurt, vanilla, and maple syrup. Set in the fridge for at least 2-3 hours or until all the chia seeds are fully softened and tripled in size. In the meantime, rinse the raspberries or soak them in a vinegar and water solution (1:3 ratio) for 5-7 minutes to remove any lingering pesticides or dirt. Scoop about 1/2 of the chia pudding into a small bowl or parfait cup. Top with the raspberries then garnish generously with grated chocolate. Serve immediately or let sit in the fridge to allow the flavours to combine. Store in the fridge in an air-tight container for up to 3 days. This looks so delicious it’s making my mouth drool! 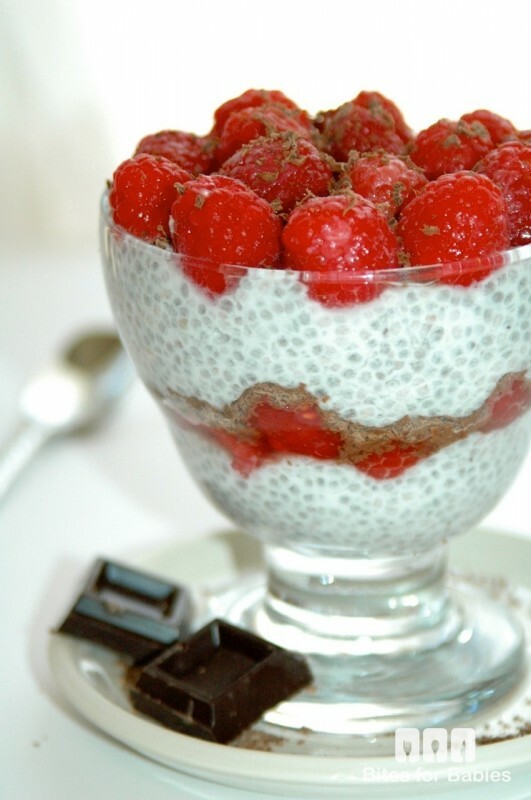 I love chia, pudding, parfait, and raspberry all separately so together these must be a heavenly combo. I’ve never tried these, but I love tapioca. Your pictures make all these things look really delicious. I will definitely be giving these a try! That looks so good! I haven’t tried chia seeds yet. Now I’m so interested to try it. Yum! This looks really good. I think I will make this for my mom, she would love it. Hope you sneak a bite too…it’s delicious! OMG I just so wanna give this a try – looks super yummy gosh! This looks so delicious! I would love to make this for my little son! This looks amazing! I love raspberries and chia seeds. And chocolate too, right?! lol! I love chia seeds! This sounds like a great and easy recipe. 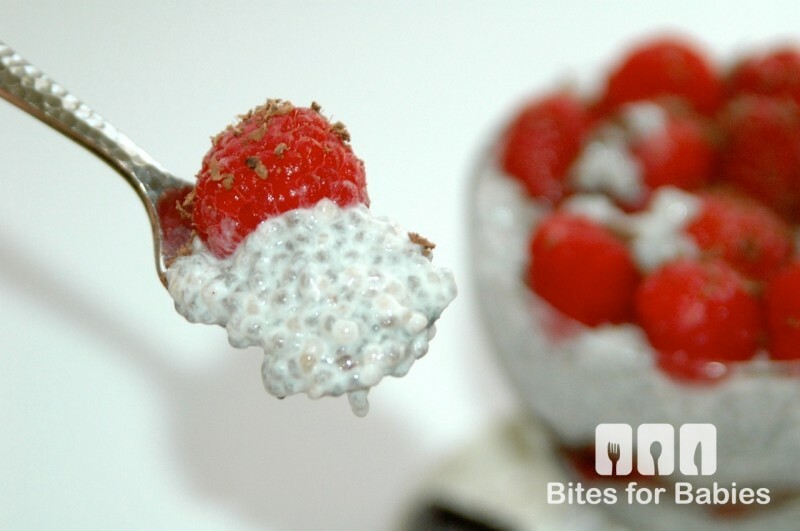 I have seen a lot of recipes lately with chia seeds, but I have never tried them before, but this looks really good! It’s so easy to add them to recipes; to salads, baked goods, raw pudding, overnight oats, stir-frys, etc. You’ve got some great looking dessert here. I love the idea of adding chia seeds. This is happening. I love chia seeds. LOVE them! I know that I would love this! Looks delicious! 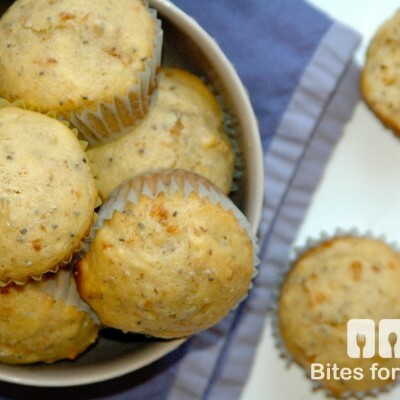 Perfect for breakfast or a treat. Those raspberries look amazing! Now I need to go buy more! Yum! This looks incredible! I haven’t tried anything with Chia before so this looks like it would be a great place to start and try that! You’ll be surprised at how similar the consistency is to eggs! Oh I’d love to taste this goodness! Thanks for the recipe also! What a wonderful recipe, my kids would love this and exactly!! I’ll make it later! Thanks. Oohhh this looks so good! I can’t wait to try it this weekend! Love raspberries!!! Me too! I add it to everything; pudding, energy bars, granola, baked goods, yogurt, on salads..
Ok, I’ll hold you to it, lol! Oh boy, you are making me drool lol. This looks super delicious! Thank you so much for sharing the recipe, I will try this for sure when I have the ingredients. Good to know! I hope you do..you’ll love it! I don’t eat any dairy (my kids do) but they also love coconut milk so I usually make it with that…and we’re all happy! That looks delicious! I’m not sure if I would like the texture but I have only heard good things about Chia seeds so I may have to give this a try! I don’t like pudding in general but if I do eat it, it’s only this way! I love Tapioca pudding, but I never eat it because I’m trying to eat a least a little bit healthily. This chia pudding looks like a great substitute. It definitely is and it’s super healthy! I haven’t had raspberries in a while. This looks so good, I’ll have to try it. I can’t wait until they’re in season! Yum! I’m so obsessed with Chia lately! I mean its delicious and healthy, how can you go wrong?! Really?! I never would have thought that they would be up to par like the ones on Foodgawker!! Thanks for planting the seed (and the compliment! )…I’m going to check it out! Your pictures are gorgeous. They make me hungry just by looking at them. And they inspire me to try more in the kitchen. I really think you can get into Foodgawker…Food is your passion and it shows. Lisa – your photos are so amazing. And I want to eat that!